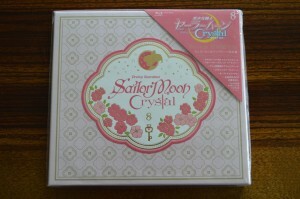 The latest release of Sailor Moon Crystal on Blu-Ray was released on May 13th. Volume 8 collects acts 15 and 16. 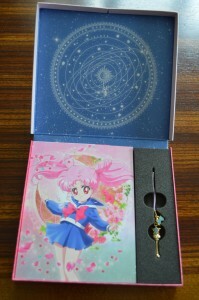 It’s packaging showcases Chibiusa. You can buy this volume on Amazon Japan and CD Japan. It only has Japanese audio with no English subtitles, though it will play in North American Blu-Ray players. 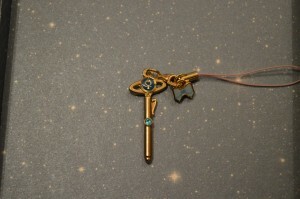 The charm included this time is Sailor Mercury’s Star Power Stick. 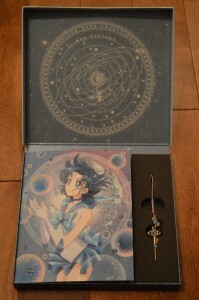 Her original transformation item was released with volume 2 when Sailor Mercury first appeared on the cover. 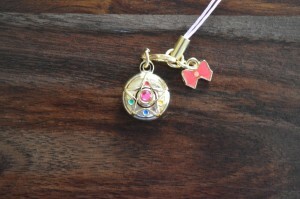 It’s a safe bet that the next 3 releases will have Sailor Mars, Jupiter and Venus’s Star Power Sticks as charms. 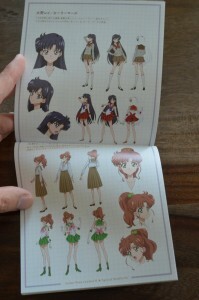 The 20 page special booklet included this time has the same breakdown as others, included episode summaries, screenshots, character art and a special page by Fumio Osano, Osabu. 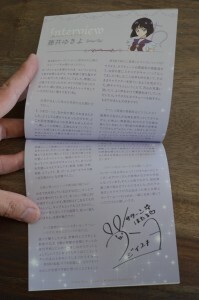 The interviews included in this release are with Yu Kaminoki, producer for the series and Misato Fukuen, the voice actress who plays Chibiusa. 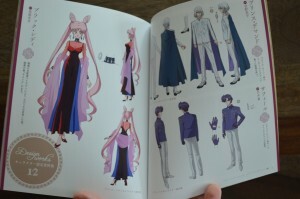 The character art included mostly focuses on Chibiusa but also has Koan and Berthier of the Ayakashi Sisters. 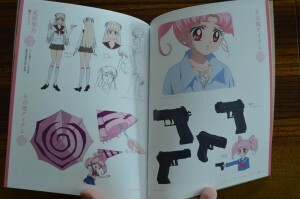 There’s a heavy amount of focus on Chibiusa with her gun. Can any gun nuts identify exactly what model of gun this is and whether or not it can be equipped with an optional flower clip? 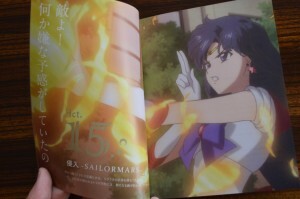 The episodes included are Act 15, Infiltration – Sailor Mars, in which Sailor Mars faces off again Koan, and Act 16, Abduction – Sailor Mercury, in which Sailor Mercury faces off again Berthier. 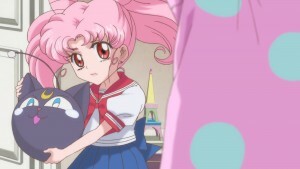 Chibiusa showed up at the end of the last release so now we begin focusing on the battle with the Black Moon Clan. Both episodes on this disk have minor changes to their animation that’s been done for the Blu-Ray release. I didn’t note anything terribly significant as far as changes go. You can check out the differences in Act 15 and Act 16 on Crystal Comparisons, which details the changes between the streaming version and home video versions of the show. More shocking here is the lack of change! 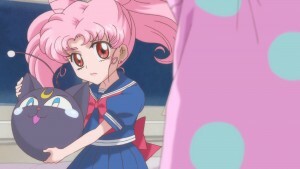 The next episode preview for Act 17 shows Chibiusa with a short sleeved but dark blue uniform. As we’ve covered in our review of Act 17, this was an incorrect colour which was actually corrected for the episode proper. The animators change things like this up until the last minute and update all kinds of things for the Blu-Ray but no one is bothering to fix up the next episode previews so that they don’t include these errors! Shameful! As always as I don’t speak Japanese I can’t comment much on the audio commentary. There are three people appearing on these commentaries. 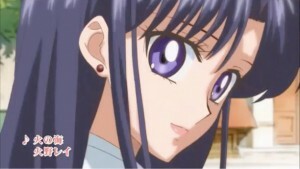 You can hear Rina Sato, the voice of Sailor Mars, Hisako Kanemoto, the voice of Sailor Mercury and Munehisa Sakai, the series director for Sailor Moon Crystal. 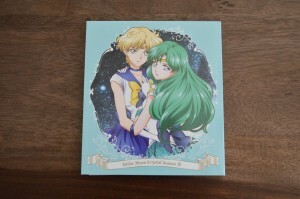 As with other releases it’s hard to justify buying a fairly expensive release for just two episodes. I don’t imagine I’ll change anyone’s mind on buying these at this point. Either you’ve bought the other releases and will buy this too, or you won’t be buying any. 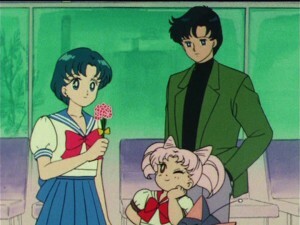 With free viewing options available for Sailor Moon Crystal and an English version inevitably happening in the future, this isn’t something many English speaking fans will find much value in. 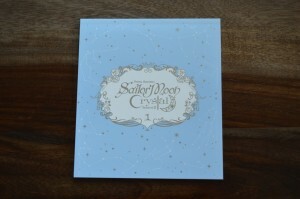 Keep reading for more images of the packaging and all pages of the included special booklet. 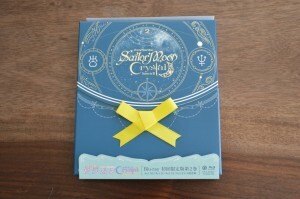 We previously announced that a Sailor Moon Crystal Character Song Collection CD would be released on April 29th. Previews of all songs have been posted to the official Sailor Moon Instagram page. The first 9 tracks posted match the names given in the track listing earlier. The final song was previously posted to YouTube. The clips on Instagram are all 15 seconds, the maximum length for videos on the site, but with a sample of every track we get a good idea of what’s in store for next week. All video clips are embedded below. 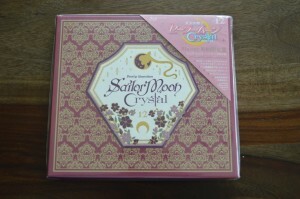 A Sailor Moon Crystal Character Song Collection CD will be released on April 29th. 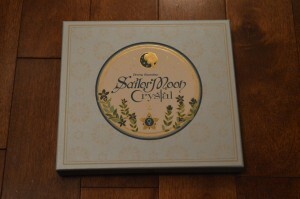 A preview of this CD has been posted to the Official Sailor Moon site. Just what is this? This is not music or songs from Sailor Moon Crystal but rather songs performed by the voice actors from the show. 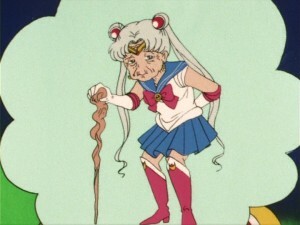 The old Sailor Moon Anime frequently had these and occasionally included them in the series. The site mentions that it has been nearly 20 years since the release of a Character Music Collection. 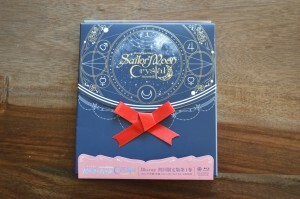 This should be a surprise to fans of the 2003 Sailor Moon Live Action series which had many albums and singles of character songs by the main cast. 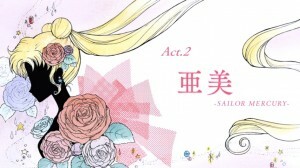 The full track listing in Japanese is on the Sailor Moon official site. There are 10 tracks in total. Songs will be performed by the voices of Sailor Moon by Kotono Mitsuishi, Sailor Mercury by Hisako Kanemoto, Sailor Mars by Rina Sato, Sailor Jupiter by Ami Koshimizu, Sailor Venus by Shizuka Ito, Tuxedo Mask by Kenji Nojima, Jadeite by Daisuke Kishio, Nephrite by Kosuke Toriumi, Zoisite by Masaya Matsukaze and Kunzite by Eiji Takemoto. 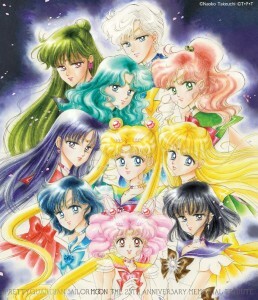 All of the Sailor Guardians have their own solo tracks, as does Tuxedo Mask. 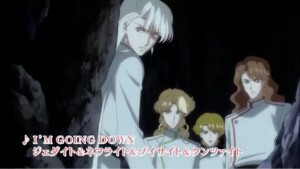 The Shitennou all perform together on one track. 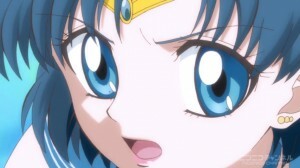 Two duets are done, one with Sailor Mercury and Sailor Jupiter and the other with Sailor Mars and Sailor Venus. 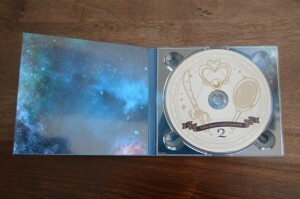 The final track has all of the Sailor Guardians performing together. You can preorder the CD from Amazon Japan or CD Japan for 3240 yen, about $27 US. 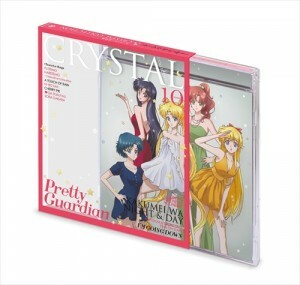 The latest volume of Sailor Moon Crystal was released on Deluxe Limited Edition Blu-Ray on November 12th (Amazon Japan, CD Japan, JList, YesAsia) while the regular edition Blu-Ray (Amazon Japan, CD Japan, YesAsia) and DVD (Amazon Japan, CD Japan, YesAsia) will be released on December 10th. This release, like the first one, only included two episodes. 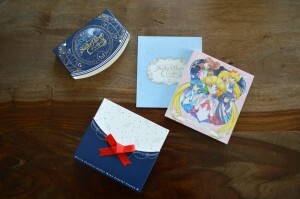 This month we have Act 3, Rei – Sailor Mars, and Act 4, Masquerade Dance Party. 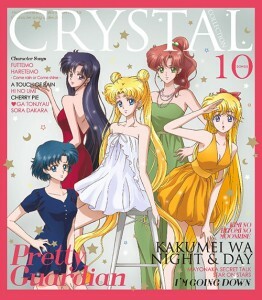 To celebrate Sailor Mars’s appearance we have Sailor Mercury on the cover and a Sailor Mercury charm included. 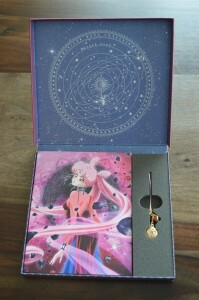 Each Deluxe Limited Edition set comes in a fancy box with a special book and a charm to add to the charm bracelet which was included with vol. 1. 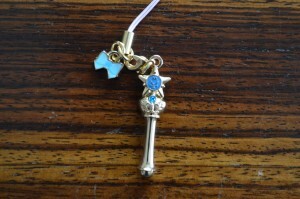 This charm is of Sailor Mercury’s transformation pen. The disk itself is similar to the first one. 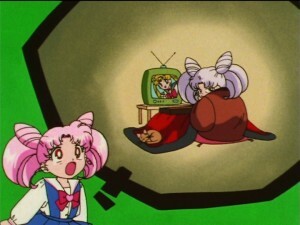 Episodes are included in HD with great image quality. Some of the scenes which originally had some pretty bad animation have been touched up. 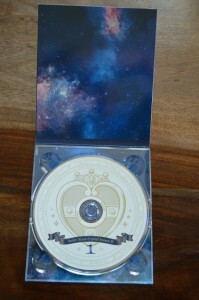 The Blu-Ray is region A, which will play in a North American Blu-Ray player, however the audio is in Japanese and there are no English subtitles. An audio commentary is included, also in Japanese, so I don’t have any real details on what they talk about! 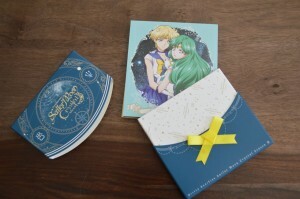 The box also comes with a special 24 page book. 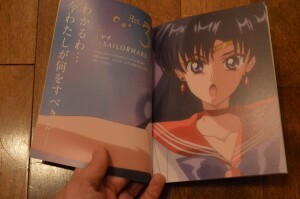 This includes a summary and images for act 3 and 4, interviews with Atsutoshi Umezawa, executive producer for Sailor Moon Crystal, and Hisako Kanemoto, the voice actress for Sailor Mercury, character art for Sailor Mercury and other characters, backgrounds and a special page by Osabu, Fumio Osano, editor of Sailor Moon. The set is expensive for only including two episodes, but has a lot of cool extras. It may be of interest to collectors but if you’re just looking to watch the show, you may want to stick with the free and totally legal streaming version. Keep reading for more images from this set including photos of all pages of the included book. 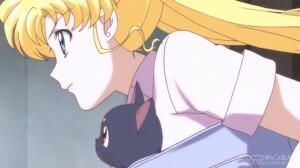 The preview for the next episode of Sailor Moon Crystal was not included in the Crunchyroll and Hulu feeds of the show however it was included in the Niconico version. I had not seen it when I posted about the first episode, only speculating about what was coming next. 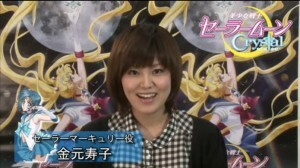 You can watch that clip by viewing it on Niconico or watching the YouTube clip embedded below. Act.2 Ami – Sailor Mercury, follows the naming convention for chapters of the manga as we’re introduced to Sailor Moon’s first companion, the Sailor Guardian Sailor Mercury as voiced by Hisako Kanemoto. From the looks of it this episode will once again be following the manga fairly closely. Episode 2 will air on Saturday July 19th at 7pm Japan Standard Time which is 6am Eastern Standard Time or 3am Pacific Standard Time. Check out this link for details on how to watch the show. Want to keep watching the next episode previews? 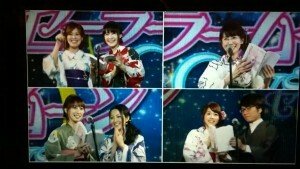 You’ll have to keep watching on Niconico which is only free for the first two weeks. Niconico’s premium service is fairly painless to sign up for through the web site with Pay Pal for 540 yen (about $5 US) per month. This is also the easiest way to view the show in Japanese without subtitles.